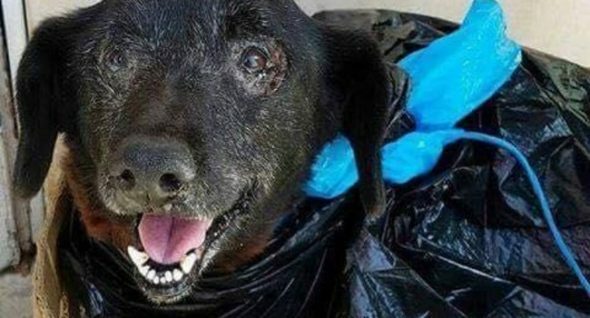 They Brought Her To The Shelter In A Black, Plastic Garbage Bag…. Blackie arrived at the Carson Animal Shelter in Gardena, CA, in a garbage bag. These kinds of situations, sadly, are not that uncommon. The distinction here is that it was her owners who put her in the bag. The 10-year-old dog, her sweet black face frosted senior silver, had a bleeding tumor on her tail. Her owners didn’t want to get blood in the car as they took her to the shelter — where they left her. 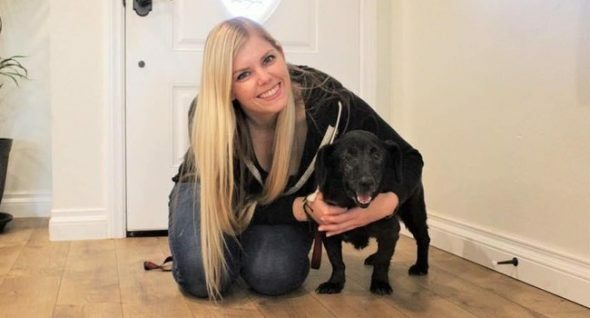 “Blackie was surrendered because she was bleeding all over,” Kelly Smíšek, executive director of Frosted Faces Foundation (FFF), a rescue group based in San Diego, told The Dodo. The homeless pup was given a kennel at the shelter, but she didn’t have to stay long. Volunteers from FFF headed to the shelter to pick her up. Blackie was sweet and friendly, despite all that she’d been through. She found the loving company comforting, it seemed. “She slept for the entire car ride, and when she arrived at FFF, she wanted to sniff everyone and everything,” Smíšek said. Volunteers brushed her, bathed her and trimmed her nails. They fed her a good, hearty meal (seen below in this video). 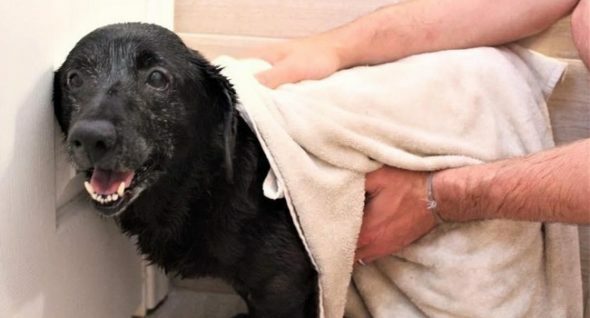 Through it all, Blackie reveled in the attention, though everyone noticed she seemed to feel pain from her tumor — during bathtime she let everyone know she’d prefer they not touch it. Soon it won’t be an issue. She’ll be getting good veterinary care and is expected to make a full recovery. Once there, she’ll be up for adoption. In the meantime, Blackie will get lots of love and attention from the FFF volunteers. “We are privileged to be able to provide Blackie the care she desperately needed, offer the compassion that her family clearly did not qualify her for and we are honored to find her a family that she, FFF and all her virtual supporters will be proud of,” Smíšek said.